While not religious, I do try to follow church "politics" a little. Christchurch has had a bit of a bad run with Catholic Bishops. Back in the'80s we had bishop Ashby. known as the "Red Bishop", Ashby was on board with all the socialist causes, particularly the anti Springbok Tour Movement. We then had the comparitively "conservative", Bishop Meeking. We then went backwards with another left leaning, left footer, Bishop John Cunneen. Bishop Cunneen was an ally of the late Marxist priest, John Curnow, probably the most subversive NZ cleric in modern times. In October, another Curnow ally tok over the top job. 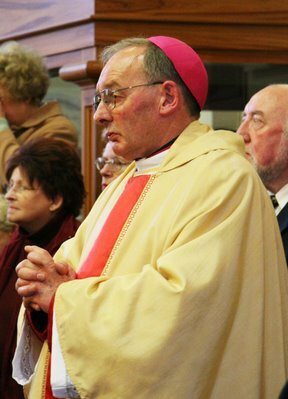 Barry Jones was ordained by his predecessor, John Cunneen as the Coadjutor Bishop for the Catholic Diocese of Christchurch. A member of the Council of Priests and of the Bishop's College of Consultors for the diocese, he is a member of the Christchurch Commission for Justice and Peace, and for fifteen years worked in the diocesan Maori Mission. Before moving to the Cathedral of the Blessed Sacrament as Administrator in 2003, he was Director of Good Shepherd House, responsible for the preparation and formation of young men accepted by the Bishop for seminary training. In addition he was a founding member of the New Zealand Bishops' Gender Issues Committee, and served on the Social Justice Committee for Caritas. Justice and Peace is of course the radical cuckoo in the Church nest, while Caritas is the Church's organ for channelling parishioners money to "politically suspect" overseas groups and causes. Bishop Jones is an advocate of "Liberation Theology", a subversive teaching increasingly influential in the Catholic Church, particularly in the Philippines and Latin America. Liberation Theology is basically Marxism dressed up as Christianity. In November 1986, Barry Jones and Auckland ultra radical priest, Fr Bernard Dennehy, wrote some articles for Peacelink magazine, specifically dealing with Liberation Theology. I quote from Fr Jones' article "Liberation Theology-An Introduction"
It uses concepts taken from Marx, to explain and illuminate-not because he is an oracle, but because the concepts actually do explain and illuminate." Silly old me. I thought a Catholic priest would be relying on the bible and church teachings for guidance. Not some 19th century atheist who has inspired the murder of millions, including not a few Christians. Maybe I'm just too old fashioned. I bet people like that sure don't care about other Christians. The World Council of Churches, quite notorious for being pro-Communist during and even after the Cold War praises Communist China as a "beakon of freedom" for Chinese Christians. Despite that Chinese Christians are brutally oppressed. I also wonder who is certainly radicalizing these people into combing Marxism with Christianity. In the Bible it says that 'it's easier to get a camel through the eye of a needle than for a rich man to get into heaven'. Jesus spread the loaves and fish amongst a huge group of people. Jesus also took direct action against the scum bag capitalists of his day. He turned over the money lenders' tables. In the book of Isaiah it says we should smash swords into ploughshares. Many anti-militarist christians have even spent time in jail to put these views into practice (through smashing up military equipment). Christians who take part in campaigns for social justice and human rights are just following the word of Jesus. Good on them. So now the Bible is part of socialism? Yea sure. Not. Just typical elitist thinking Liberation Theologian really is. Selective quoting does not help one's case well. The churches are more than willing to take big sums of money when it comes to doing up their buildings and some churches own extensive amounts of property worth millions, perhaps tens of millions. Socialism is slavery, capitalism is freedom. Very simplistic slogans sure, but that is why there are also many Christians who are right-wing in their views. Left wing Christians tend to come from churches that emphasise religiosity or liberalism, the Catholic church is a prime example but also some Anglicans etc. I have many friends in churches who are small businessmen, there is no conflict for them between their faith and their business acumen, there is a big conflict with socialist governments and politicians (like in NZ now) who in their not so subtle ways want to shut down the freedom to worship. Look at Labour's obsession with the Exclusive Brethren as a more prominent example of this. Patrick, I want to make it clear, I was not attacking Catholicism, or Christianity. I regard Christianity as a pro freedom religion and "conservative" Christians as allies in the pro freedom cause. What I was attacking was the Marxism, masquerading as Christianity that has heavily infiltrated all the "mainstream" churches.